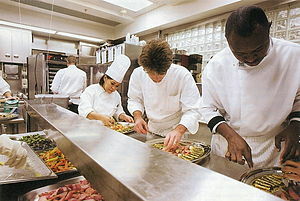 Plan to attend the Great Chefs Tasting Party 2012 in Chicago, a benefit for United Cerebral Palsy. Fifty chefs from Chicago’s will be featured including Jared Van Camp, executive chef of Nellcôte. Enjoy tastings of signature dishes from Chicago’s star chefs. There will be a live auction and a cook-off between Jared Van Camp of Nellcôte and Chris Pandel of The Bristol for the VIP guests. WHEN: Tuesday, June 5, 2012 from 5 p.m.–9 p.m.
All but $20 of the ticket price is tax-deductible. Proceeds benefit the children and adults served by United Cerebral Palsy Association of Greater Chicago. Call 312-765-0419, ext.21 for more information.